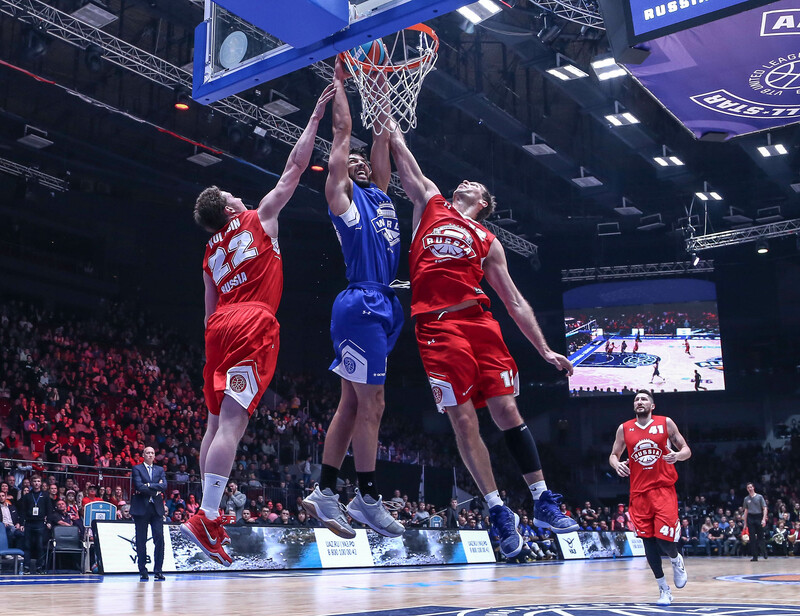 After tallying the fan votes and asking 19 media outlets representing six countries to provide their top choices for the big game, the VTB United League has released the rosters for the 2019 All-Star Game, which will be played in Moscow on February 17. The League has two more wild card picks to make. The final team rosters, each consisting of 12 players, will be announced soon. Russian Stars: Vitaly Fridzon, Dmitry Kulagin (Lokomotiv-Kuban), Ivan Strebkov (Nizhny Novgorod), Evgeny Voronov (Zenit), Alexey Shved (Khimki), Sergey Karasev (Zenit), Joel Bolomboy, Andrey Vorontsevich (CSKA), Artem Klimenko (Avtodor), Artem Zabelin (Avtodor). World Stars: Sergio Rodriguez, Nando De Colo (CSKA), Jamar Smith (UNICS), Kendrick Perry (Nizhny Novgorod), Anthony Clemmons (Astana), Perrin Buford (Avtodor), Jalen Reynolds (Zenit), Maurice Ndour (UNICS), Jordan Mickey, Anthony Gill (Khimki). – Each team had to consist of 10 players: five backcourt and five frontcourt. – No more than two players from one club on a team. Alexey Shved, Dmitry Kulagin, Ivan Strebkov, Mikhail Kulagin, Evgeny Voronov, Vladislav Trushkin, Dmitry Uzinsky, Joel Bolomboy, Artem Klimenko, Artem Zabelin. Nando De Colo, Cory Higgins, Anthony Clemmons, Jamar Smith, D’Angelo Harrison, Perrin Buford, Rashard Kelly, Anthony Gill, Jordan Mickey, Jalen Reynolds. Alexey Shved, Dmitry Kulagin, Ivan Strebkov, Dmitry Khvostov, Evgeny Voronov, Sergey Karasev, Dmitry Uzinsky, Joel Bolomboy, Artem Klimenko, Andrey Vorontsevich. Nando De Colo, Errick McCollum, Anthony Clemmons, Trae Golden, Kendrick Perry, Dorell Wright, Perrin Buford, Jalen Reynolds, Anthony Gill, Jordan Mickey. Alexey Shved, Dmitry Kulagin, Ivan Strebkov, Vitaly Fridzon, Anton Ponkrashov, Nikita Mikhailovsky, Sergey Karasev, Sergey Monia, Joel Bolomboy, Andrey Vorontsevich. Sergio Rodriguez, Cory Higgins, Anthony Clemmons, Errick McCollum, Jamar Smith, Perrin Buford, J.J. O’Brien, Anthony Gill, Jordan Mickey, Jalen Reynolds. Alexey Shved, Dmitry Kulagin, Evgeny Voronov, Evgeny Baburin, Viacheslav Zaitcev, Konstantin Bulanov, Sergey Karasev, Artem Zabelin, Joel Bolomboy, Artem Klimenko. Sergio Rodriguez, Cory Higgins, Anthony Clemmons, Kendrick Perry, Devon Saddler, Perrin Buford, Tre’ McLean, Anthony Gill, Rashard Kelly, Jalen Reynolds. Alexey Shved, Dmitry Kulagin, Dmitry Khvostov, Evgeny Voronov, Ivan Strebkov, Sergey Karasev, Sergey Monia, Artem Zabelin, Andrey Vorontsevich, Artem Klimenko. Sergio Rodriguez, Nando De Colo, Anthony Clemmons, Branko Mirkovic, Devon Saddler, Perrin Buford, Jordan Mickey, Anthony Gill, Rashard Kelly, Jalen Reynolds. Alexey Shved, Dmitry Kulagin, Vitaly Fridzon, Anton Ponkrashov, Denis Zakharov, Sergey Karasev, Joel Bolomboy, Artem Zabelin, Andrey Vorontsevich, Artem Klimenko. Nando De Colo, Anthony Clemmons, Kendrick Perry, Trae Golden, Jamar Smith, Perrin Buford, Jordan Mickey, Anthony Gill, Maurice Ndour, Dorell Wright. Alexey Shved, Dmitry Kulagin, Dmitry Khvostov, Anton Ponkrashov, Evgeny Voronov, Sergey Monia, Dmitry Uzinsky, Joel Bolomboy, Igor Kanygin, Andrey Vorontsevich. Sergio Rodriguez, Codi Miller-McIntyre, Janis Blums, Jamar Smith, Kendrick Perry, Tre’ McLean, Jalen Reynolds, Anthony Gill, Maurice Ndour, Dorell Wright. Alexey Shved, Dmitry Kulagin, Mikhail Kulagin, Ivan Strebkov, Vitaly Fridzon, Sergey Karasev, Dmitry Uzinsky, Joel Bolomboy, Artem Klimenko, Artem Zabelin. Trae Golden, Nando De Colo, Jamar Smith, Anthony Clemmons, D’Angelo Harrison, Perrin Buford, Jalen Reynolds, Jordan Mickey, Maurice Ndour, J.J. O’Brien. Alexey Shved, Dmitry Khvostov, Vitaly Fridzon, Anton Ponkrashov, Evgeny Voronov, Sergey Karasev, Sergey Monia, Joel Bolomboy, Andrey Vorontsevich, Artem Zabelin. Sergio Rodriguez, Nando De Colo, Jamar Smith, Trevor Lacey, Philip Scrubb, Perrin Buford, Anthony Gill, Jordan Mickey, Maurice Ndour, Dorell Wright. Nando De Colo, Cory Higgins, Anthony Clemmons, Jamar Smith, D’Angelo Harrison, Perrin Buford, Rashard Kelly, Anthony Gill, Jordan Mickey, Alexander Zhigulin. Alexey Shved, Dmitry Kulagin, Ivan Strebkov, Mikhail Kulagin, Dmitry Khvostov, Sergey Karasev, Alexander Vinnik, Joel Bolomboy, Artem Klimenko, Artem Zabelin. Nando De Colo, Cory Higgins, Anthony Clemmons, Jamar Smith, D’Angelo Harrison, Perrin Buford, Maurice Ndour, Andrejs Grazulis, Jordan Mickey, Jalen Reynolds. Alexey Shved, Dmitry Kulagin, Ivan Strebkov, Vitaly Fridzon, Denis Zakharov, Sergey Karasev, Andrey Vorontsevich, Joel Bolomboy, Artem Klimenko, Artem Zabelin. Nando De Colo, Sergio Rodriguez, Kendrick Perry, Jamar Smith, Trae Golden, Perrin Buford, Mateusz Ponitka, Anthony Gill, Jordan Mickey, Jalen Reynolds. Alexey Shved, Dmitry Kulagin, Anton Ponkrashov, Vitaly Fridzon, Denis Zakharov, Sergey Karasev, Sergey Monia, Andrey Vorontsevich, Joel Bolomboy, Artem Zabelin. Nando De Colo, Sergio Rodriguez, Kendrick Perry, Jamar Smith, Anthony Clemmons, Perrin Buford, Reggie Lynch, Anthony Gill, Jordan Mickey, Jalen Reynolds. Alexey Shved, Dmitry Kulagin, Mikhail Kulagin, Dmitry Khvostov, Anton Ponkrashov, Sergey Karasev, Nikita Mikhailovsky, Vladislav Trushkin, Joel Bolomboy, Artem Zabelin. Nando De Colo, Cory Higgins, Kendrick Perry, Jamar Smith, D’Angelo Harrison, Perrin Buford, Mateusz Ponitka, Maurice Ndour, Jordan Mickey, Jalen Reynolds. Alexey Shved, Dmitry Kulagin, Evgeny Baburin, Dmitry Khvostov, Anton Ponkrashov, Sergey Karasev, Sergey Monia, Andrey Vorontsevich, Joel Bolomboy, Artem Zabelin. Nando De Colo, Sergio Rodriguez, Errick McCollum, Stefan Markovic, Janis Blums, Andrejs Grazulis, Vitali Liutych, Reggie Lynch, Anthony Gill, Jalen Reynolds. Alexey Shved, Dmitry Kulagin, Evgeny Baburin, Vitaly Fridzon, Evgeny Voronov, Sergey Karasev, Artem Klimenko, Andrey Vorontsevich, Joel Bolomboy, Artem Zabelin. Nando De Colo, Cory Higgins, Anthony Clemmons, Kendrick Perry, Trae Golden, Perrin Buford, Anthony Gill, J.J. O’Brien, Jordan Mickey, Jalen Reynolds. Alexey Shved, Dmitry Kulagin, Dmitry Khvostov, Anton Ponkrashov, Ivan Strebkov, Sergey Karasev, Vladislav Trushkin, Andrey Vorontsevich, Joel Bolomboy, Artem Zabelin. Sergio Rodriguez, Branko Mirkovic, Trae Golden, Jamar Smith, Anthony Clemmons, Perrin Buford, Maurice Ndour, Dorell Wright, Andrejs Grazulis, Jalen Reynolds. Alexey Shved, Vitaly Fridzon, Denis Zakharov, Dmitry Kulagin, Evgeny Baburin, Sergey Karasev, Andrey Vorontsevich, Artem Klimenko, Artem Zabelin, Alexander Vinnik. Nando De Colo, Stefan Markovic, Kendrick Perry, Jamar Smith, Branko Mirkovic, Michal Sokolowski, Mateusz Ponitka, J.J. O’Brien, Perrin Buford, Jalen Reynolds. Alexey Shved, Dmitry Kulagin, Evgeny Voronov, Vitaly Fridzon, Mikhail Kulagin, Sergey Karasev, Andrey Vorontsevich, Artem Zabelin, Artem Klimenko, Joel Bolomboy. Nando De Colo, Cory Higgins, Anthony Clemmons, Jamar Smith, D’Angelo Harrison, Perrin Buford, Anthony Gill, Dorell Wright, Jordan Mickey, Jalen Reynolds. Alexey Shved, Dmitry Kulagin, Ivan Strebkov, Vitaly Fridzon, Mikhail Kulagin, Sergey Karasev, Nikita Mikhailovsky, Artem Zabelin, Artem Klimenko, Joel Bolomboy. Nando De Colo, Kendrick Perry, Anthony Clemmons, Jamar Smith, D’Angelo Harrison, Perrin Buford, Anthony Gill, Maurice Ndour, Jordan Mickey, Jalen Reynolds.